I’ve seen and heard numerous reviews of Apple Watch Series 2, but not very many seem to mention the newly available swim workouts, so I thought I’d give a brief rundown of how they’ve been working for me. There are two basic types of swim workout – Pool Swim and Open Water Swim. The differences between these are much like between indoor and outdoor variations of walk, run, and cycle. The Open Water Swim will utilise GPS to track your route whereas the Pool Swim will not. As with all workout types, once you select the basic swim type, you get to choose between a goal for calorie burn, time, or distance, or an open workout. But in the case of a Pool Swim you are first asked for the length of the pool. It defaults to 25 metres (yards for those of you in non-metric nations), which is perfect for my local pool, but can be set as low as 1 metre (hmmmm) and as high as… well… I stopped trying to find the limit after 1 kilometre! I’ve only used the Pool Swim workout and I’ve found it to be pretty reliable if you swim with a regular stroke. Initially I did a couple of open workouts and it kept track of distance swum very accurately – always within a couple of metres of a multiple of 25 – but sometimes would increase the lap count by one over what I had actually done. I’ve put this down to breaking stroke mid length when I had to dodge an obstacle. On a later fixed calorie goal, the distance readout immediately went to 1.2km and stayed there the entire workout – which must be a bug. In any case, the resulting saved workouts seem to be accurate. I don’t have the lung capacity to swim freestyle, so do a sidestroke and this does not seem to faze the watch, although it reports in the iPhone Workout app that I was doing freestyle. In terms of operating the watch around water, the watch enters a “screen lock” mode because water affects the basic operation of the touch screen. You can press on both the crown and side buttons to pause and resume the workout, and while paused you can rotate the crown to eject any water from the speaker cavity and unlock the screen. In practice I found I rarely have the need to interact with the watch during my workout. Pausing to rest a while does not alter the outcome of the workout other than time taken. It can be a little tricky to finish the workout straight away when you stop – where on earth do you dry a finger when you’re still in a swimming pool? After a few “orientation” swims, I now set a calorie goal (in fact a kilojoule goal) for my swim and it is very easy to roll my wrist up exactly as I do normally to check my progress. It’s kinda freaky yet cool to be able to do this under water, too. Thanks, Allister. It turns out I also use the series 2 to track my swimming. In fact, I didn’t buy the series 1 because it was (apparently) not waterproof enough. 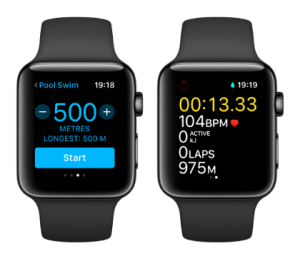 Swimming is one of my regular exercises, so I was very happy to see the series 2 capabilities. My experience is pretty much the same as yours. It seems accurate and reliable.